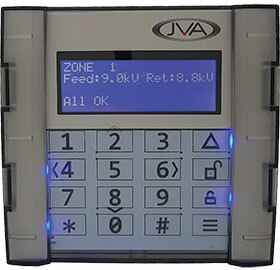 JVA is already well known for its LCD keypad that can operate up to 14 energisers from one keypad. The convenience of the JVA keypad has been that it has always allowed one keypad to be used to interface with any JVA energiser model, plus offered the added value of displaying fence voltages. The latest four-line replacement keypad takes this convenience even further. The keypad is now fully menu driven, allowing the installer to program the energiser simply by interacting with the menu system. There is no need for manuals and tedious coding sequences. The four lines of data also give the user useful extra information at a glance, such as fence and battery voltages, zone names, fence amperage, time and easy access to event logging.